[Alfredo Campoli, virtuoso violinist.] Autograph Receipt for 'sale of Music Library', Signed over tax stamp. On letterhead of 16 Park Avenue, Golders Green, London. 13 August 1947. 1p, 12mo. In fair condition, lightly aged and worn. Folded twice. 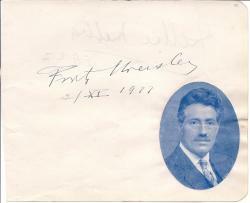 Signed, over a red 'Postage Revenue' 2d stamp: 'Alfredo Compoli. | August 13th. 1947'. Above this the receip, in Compoli's autograph, reads: 'Received £500 (five hundred pounds) in full, (£200 deposit – and £250 in cash – also cheque value £50 (dated August 11th. 1947) for Sale of Music Library (Salon Orchestra, & Trio)'. 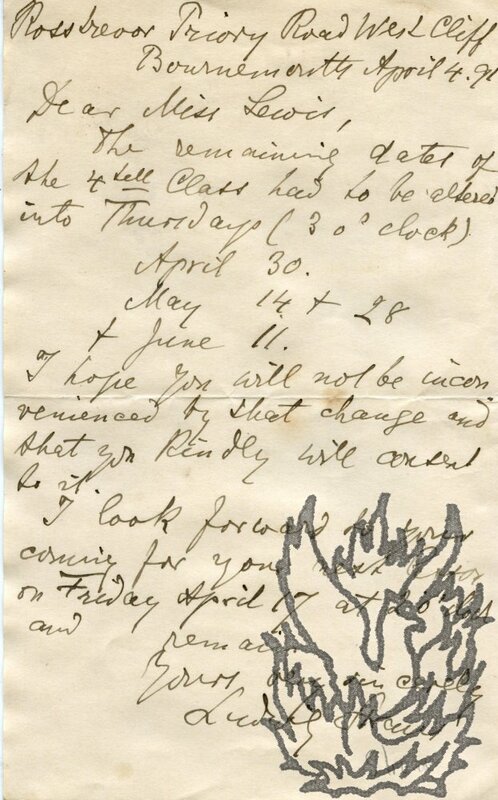 Accompanying the document is an unsigned autograph receipt on a worn slip of white paper, reading: 'April 28th. 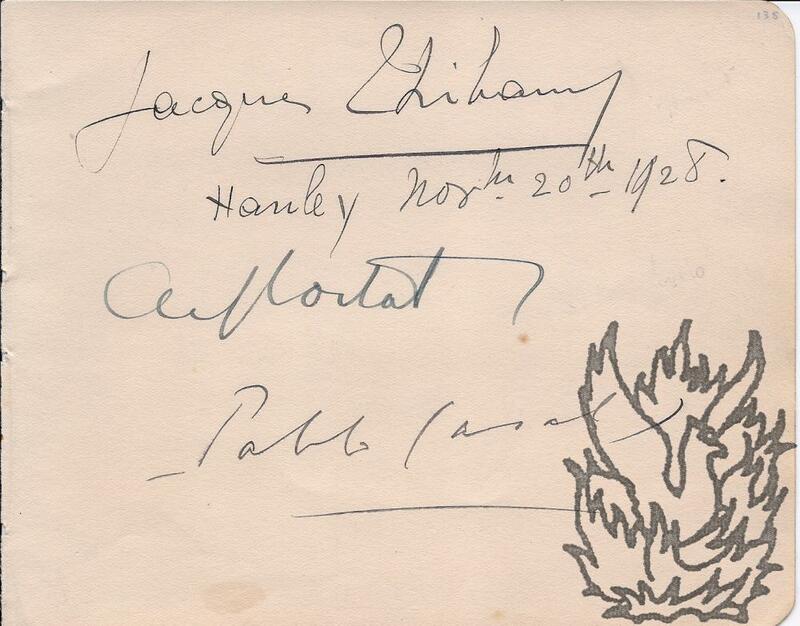 1947 | Received, from Jack Salisbury Esq. [ Camilla Urso, 'The great violin virtuoso': pamphlet issued by the United States Lyceum Bureau. ] Drophead title: 'Camilla Urso. | A Tribute.' Title on front wrap: 'A Tribute | Charles Barnard | Camilla Urso'. 'Compliments of United States Lyceum Bureau, 757 Broadway, New York.' No year, but back cover gives details of 'Transcontinental Tour. | 1885 - Season - 1886.'. pp., 16mo. Not paginated. Stapled in brown wraps, with text on front and back covers in gold and dark brown, with closed tear at foot of spine. Contains one full-page engraving: 'Testimonial Presentation to Mme. Camilla Urso in the Town Hall, Melbourne.' Cheaply printed on browned high-acidity paper, in aged and worn wraps. The wraps are attractively designed, with the violinist's name printed in large decorative type diagonally across the centre of the front cover. The back cover gives details of Urso's 'Transcontinental Tour. [ Guila Bustabo, American concert violinist. ] Autograph Signature. 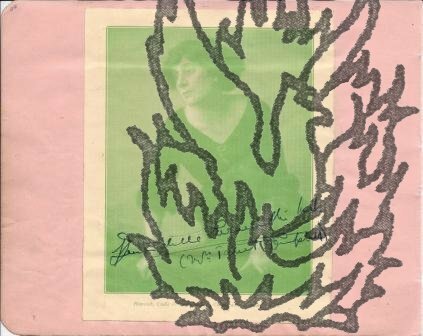 On 13 x 18 cm leaf of light-pink paper, torn from an autogaph album. Good firm large signature, rising upwards: 'Guila Bustabo.' Nothing else written on either side of the leaf. [ Albert Cazabon, violinist, composer and head of the Albert Cazabon Orchestra. ] Long letter of condolence to the widow of the conductor Herman Finck, containing personal reminiscences. 32 Aberdeen Place, N.W.8. [ London ] 24 April 1939. 1p., 4to. In fair condition, aged and worn. He informs her that Finck was 'a very old friend of mine & my father's. I knew Herman when I was a boy, & had always held his loyal friendship as something to be treasured as a great privilege. When I left for Australia in 1927 a radiogram of good wishes from him came to me at sea, & when I returned two years ago he received me in the same old warm-hearted way, & was the first friend to try to help to get me re-established in London.' He continues in the same vein, describing Finck as 'a great & well-beloved man'. 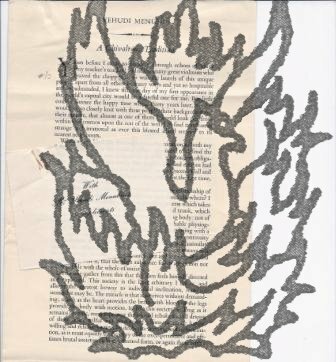 [Musician; Rostal ]A small archive of material relating to Max Rostal's musical career, including his Summer Schools, preserved by his secretary, Gladys Pankhurst. Substantial Typed Letter Signed "Max Rostal", 16 July 1956, one page, 4to, good condition, in which he writes to Gladys Pankhurst, his secretary, from Salzkammergut, Austria, requesting additional items for his school - pieces of music (specific details), a recording, 600 Players cigarettes "on the boat" i.e. duty free for three people. [Violinist] End of letter, in French, signed Johannes Wolff. Johannes Wolff (1863-1931), Dutch classical violinst popular in England. No place or date survives. Piece of paper, 11 x 7com, tipped on to larger piece of paper. "En attendant les plaisirs recus [?] Mademoiselle les sinceres salutations de votre [serv[an]t?] devoue" (or soenthoing like that, hand difficult). 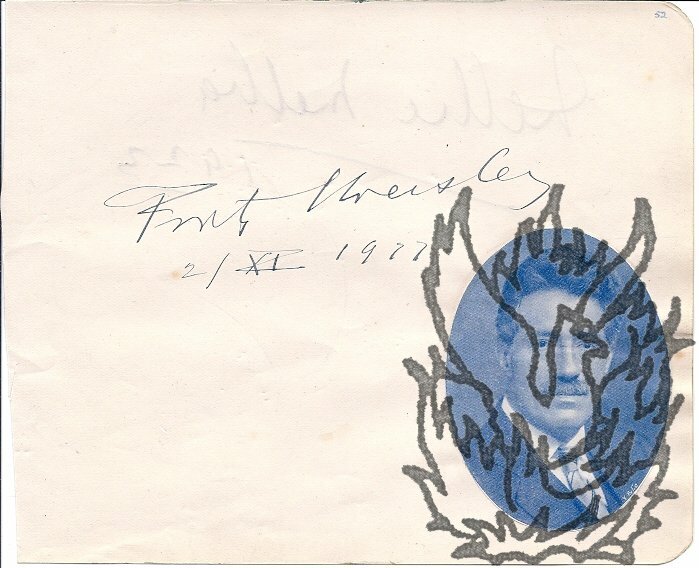 Signature only (cut from letter?) "from TwadarNachez". Part of a card, 7 x 3cm, laid down on larger piece of paper, some staining (glue?) bur signature clear. 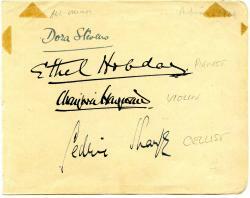 'Change of Address' card of the composer and conductor Sir Eugene Goossens, addressed to the violinist Max Rostal. 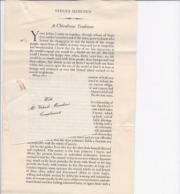 Postmarked from Maida Hill on 16 September 1957. Printed on one side of a 9 x 10.5 cm card. In good condition, lightly-aged and with a couple of corners slightly worn. 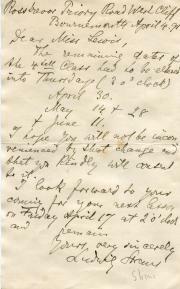 The notice reads: 'Change of Address | Please note that | Sir Eugene Goossens | is now residing at | 76 Hamilton Terrace, London, N.W.8. | Telephone: CUNningham 9383'. Docketed in pencil at head (by Rostal?) 'Received 17th Sept.' Addressed on reverse, with stamp and postmark, to 'Max Rostal Esq., Highflower, 45, Brondesbury Park, London, NW6. Bold Signatures on recto and verso of an album leaf. 2 Nov. 1922 AND 1923. Detached album leaf, c.17 x 14cm, good condition, on one side signed Fritz Kreisler | 2/XI 1922, the other Nellie Melba | 1923. A small image of Kreisler, extracted from a magazine, is below the signature. 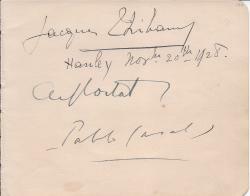 Autograph Signature ('Jan Kubelik') in pencil beneath photographic portrait on cover of Percy Pitt and A. Kalisch's programme for 'Kubelik Farewell Recital' at the Queen's Hall, London. Printed date on programme: 7 October 1905. The cover is printed on one side of a piece of shiny art paper, roughly 20.5 x 13 cm. Photograph of Kubelik and his violin roughly 10.5 x 8 cm. Paper lightly creased and with slight wear along vertical fold across middle of photograph. Good firm signature. 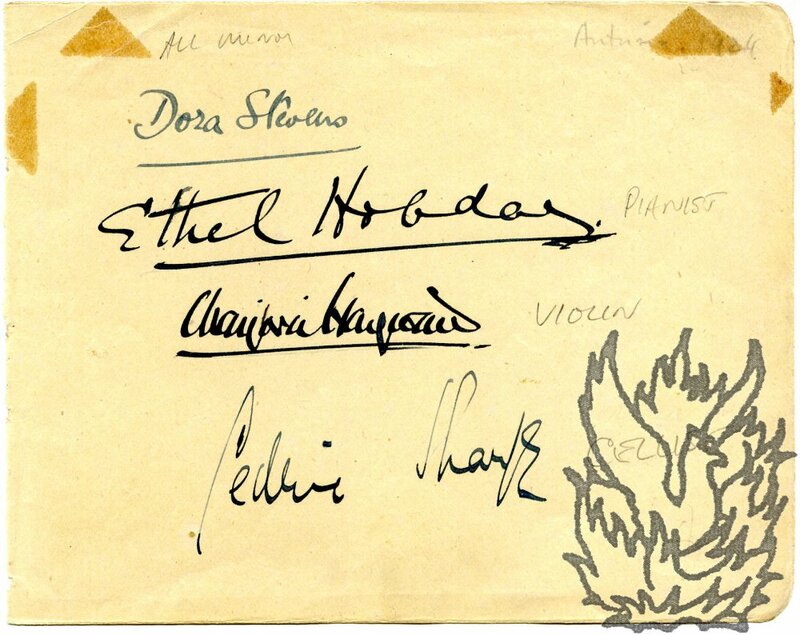 The signatures of the four musicians on one leaf. 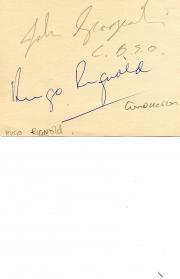 On light-yellow page (roughly 11 x 14 cm) removed from autograph album. Four glue stains showing through from the reverse (not affecting the signatures), otherwise good. Reads 'Dora Stevens | Ethel Hobday | Marjorie Hayward | Cedric Sharpe'. Lightly docketed in pencil. 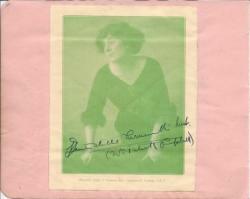 On leaf (roughly 10 x 15 cm) torn from autograph album. Good, on lightly aged paper. 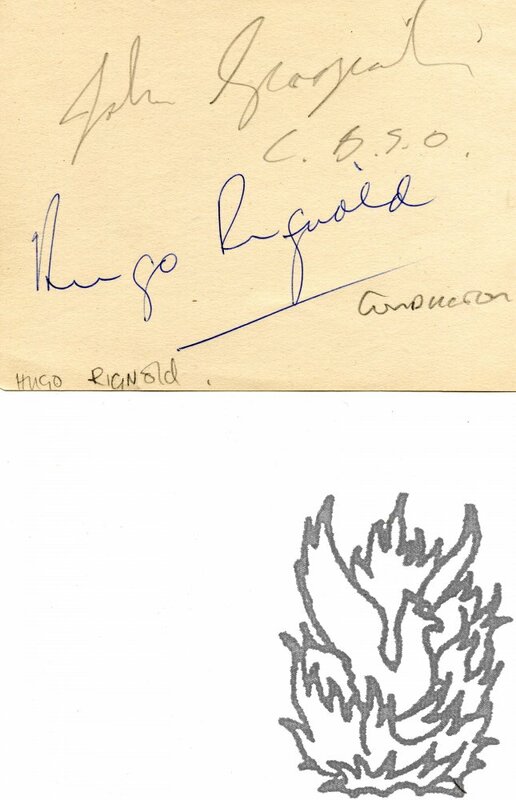 Signed 'Hugo Rignold' with another signature ('John <?> | <?>') in pencil above it. Docketed in pencil. 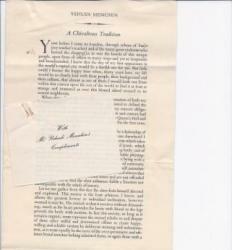 Autograph Letter Signed ('I Begrez') to unnamed male correspondent. One page, 12mo. Very good. 'I shall sing il "Soave e bel contento" [aria by Pacini] and will be happy to take a part in the quintetto[,] you must procure the parts of my song'. May possibly refer to the J. N. Hummel Benefit Concert in London on 29 April 1830, where Pacini's aria was played.